One key focus in picking out your wedding gown is not only to focus on how glamorous you look like from the front, but also how breathtaking you may look from the back. Every girl dreams of the long train or the cathedral length veil that would add drama, but why not take a different approach and give your guest the gasp that you’ve always hoped for. 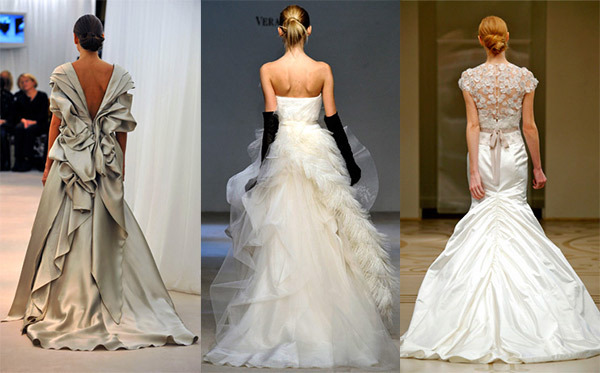 Designers such as Reem Acra, Vera Wang and Francesco Fino have worked to give you that element in their Bridal collections for Fall/Winter 2010. From tiers of tulle to drop open backs. From billowing fabrics to feathered sashes – there is that effect of drama that will leave your guests astounded by your gown selection.